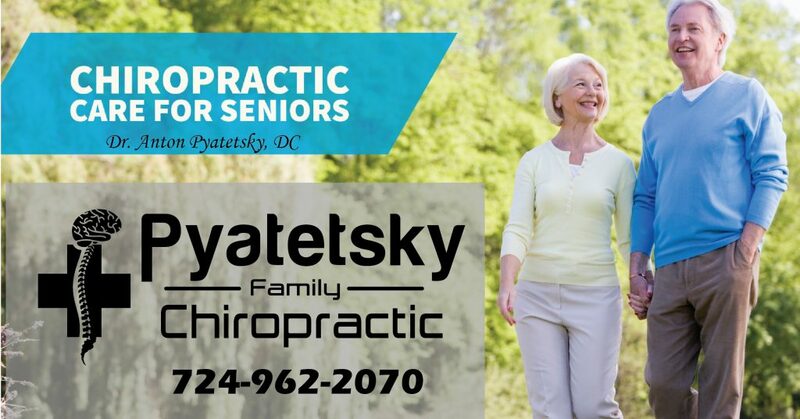 Dr. Anton Pyatetsky at Pyatetsky Family Chiropractic is trained in specific low force adjustments tailored for our eldery and geriatric patients to allow them to enjoy the quality of life they deserve! One study published in Chiropractic & Manual Therapies points to a report that found that 23 percent of older adults experience non-disabling back pain and an additional six percent suffer from disabling back pain, taking the total percentage of elderly individuals struggling with some level of back-related pain to 29 percent, or almost one-third of the population.2 Fortunately, chiropractic can provide positive results for geriatric patients with this particular type of pain by helping correct spinal misalignments and alleviating nerve impingements. 1 Administration for Community Living. “Aging statistics.” U.S. Department of Health and Human Services. http://www.aoa.acl.gov/Aging_Statistics/index.aspx. Accessed April 2015. 2 Andrew K, et al. The role of chiropractic care in older adults. Chiropr Man Therap. 2012:20(3). 3 Bracha Y, et al. Spinal manipulative therapy and exercise for seniors with chronic neck pain. Spine J. 2014:14(9);1879–1889. 4 National Center for Chronic Disease Prevention and Health Promotion, Division of Population Health. “Arthritis-related statistics.” Centers for Disease control and Prevention. http://www.cdc.gov/arthritis/data_statistics/arthritis_related_stats.htm. Updated March 2014. Accessed April 2015. 5 Hanses M, Strunk R. Chiropractic care of a 70-year-old female patient with hip osteoarthritis. J Chiropr Med. 2011:10(1);54–59. 6 Killinger, Lisa Zaynab. “Chiropractic and Geriatrics: a Review of the Training, Role, and Scope of Chiropractic in Caring for Aging Patients.” Clinics in Geriatric Medicine, vol. 20, no. 2, 2004, pp. 223–235., doi:10.1016/j.cger.2004.02.008.